【MUMBAI】Reliance Jio Infocomm has entered into a tower-sharing deal with Bharti Infratel as the telecom unit of Reliance Industries tries to tie up for 1,00,000 towers for a faster rollout of its much-awaited data and voice services. 【Ingolstad】German luxury auto brand Audi will begin selling its premium A3 Sedan in India from middle of the year and the much-awaited car will be rolled out from the company's production facility in Aurangabad. 【New Delhi】A few days after Maruti Suzuki's sales figures showed flat growth in 2013-14, Chairman R C Bhargava reckons the year ahead is going to be difficult for the car sector. 【Hyderabad】Indian IT and IT-enabled services industry is setting its eyes on the Japanese market, the second biggest IT market after the US. 【Mumbai】Showing revival in demand, domestic car sales grew (y-o-y) for the third month in succession in July, rising 5.04%, which prompted Society of Indian Automobile Manufacturers (Siam) to hope for a 5-10% increase this fiscal. 【Tokyo】Prime Minister Narendra Modi warned against the forces of “encroachment” in the world and said the global situation looked more like the 18th century. 【Tokyo/ New Delhi】India and Japan on the 1st September announced deepening of their strategic defence and economic cooperation and asked their officials to expedite inking of a pact for nuclear energy cooperation. 【Lucknow】The Uttar Pradesh government has unveiled a new electronic manufacturing policy which will enable mass production of cell phones, DVDs and computers with other products, an official said on the 23rd August. 【New Delhi】China on the 18th of September pledged to invest $20 billion in India over the next five years and remove barriers for Indian exporters of value-added items like pharmaceuticals and processed food to Chinese markets. 【New Delhi】Muslim organisation Jamaat-e-Islami Hind on the 6th of September said while Prime Minister Narendra Modi speaks of development, his silence on the divisive campaign and hate campaigns of party leaders and affiliated outfits is a great cause of concern. 【NEW DELHI】India and Australia scripted history on the 5th of September by signing a civil nuclear deal for the supply of uranium to the country's nuclear reactors, taking their partnership to a new level. 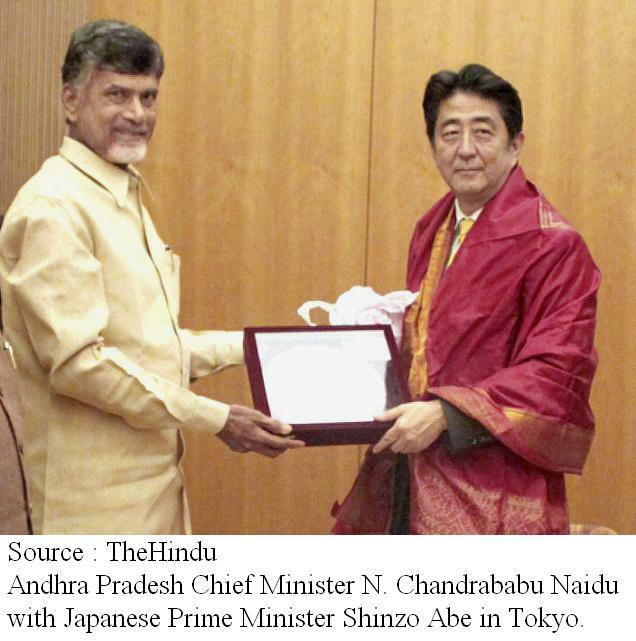 【HYDERABAD】Japanese Prime Minister Shinzo Abe on the 28th November assured Andhra Pradesh Chief Minister N. Chandrababu Naidu that Japan would extend full cooperation to Andhra Pradesh in building a world-class capital city.